NASA’s Curiosity Rover has captured footage of dust devils whirling spectacularly on Mars as summer winds blow across the Red planet. 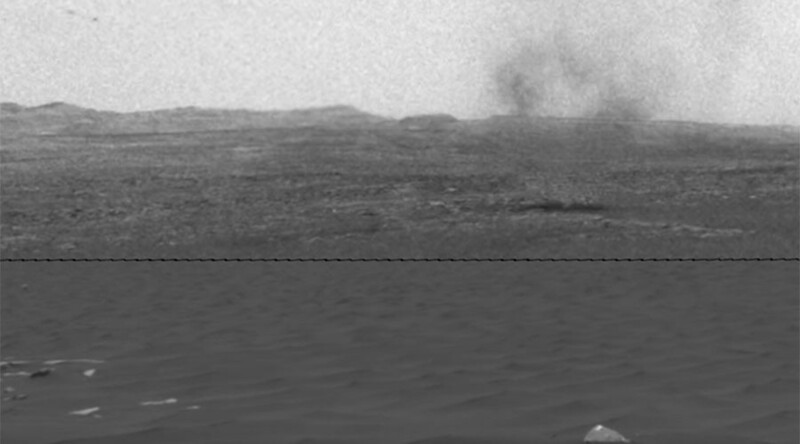 Curiosity observed several whirlwinds blowing Martian dust across the Gale Crater. The rover also measured how far the winds can move grains of sand in just one day. Dust devils form as a result of sunshine warming the ground which causes the convective rising of air. The dust devils here were spotted moving in a southward direction from the rover. It is currently summer at the Gale Crater, the windiest time of the Martian year, and conditions are ideal for investigating sand dunes in the region. "We're keeping Curiosity busy in an area with lots of sand at a season when there's plenty of wind blowing it around," said Curiosity Project Scientist Ashwin Vasavada. "One aspect we want to learn more about is the wind's effect on sorting sand grains with different composition. That helps us interpret modern dunes as well as ancient sandstones." Martian winds exert much less force than winds on our planet as the atmosphere is 100 times thinner than Earth’s. Nevertheless, winds have been instrumental in shaping Mars’ landscape over billions of years. NASA is also using the Mars Reconnaissance Orbiter in conjunction with the rover to examine wind patterns on the crater and to compare sand dunes that differ in shape from those studied previously. "The orbiter perspective gives us the bigger picture – on all sides of Mount Sharp and the regional context for Gale Crater. We combine that with the local detail and ground-truth we get from the rover," said Mackenzie Day of the University of Texas, Austin, lead author of a research report in the journal Icarus about wind's dominant role at Gale. In the video released by NASA the timing has been accelerated and the contrast modified so viewers can see changes between the frames more clearly.